Poke bowls are a longtime culinary tradition in Hawaii, but given that Abunai Poke only opened about a month ago in DC, they're pretty new to your neighborhood. 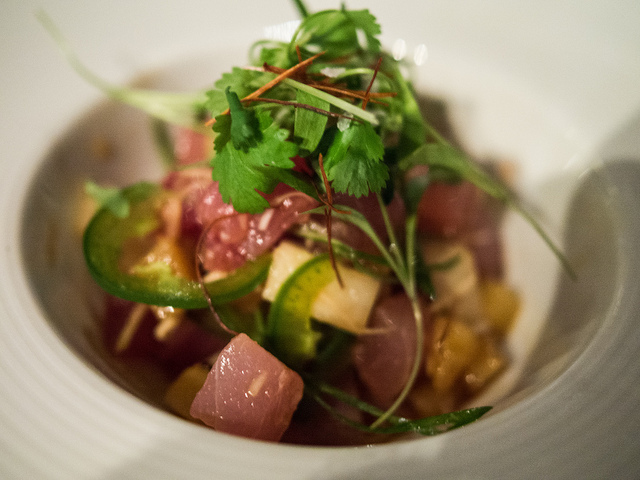 There's no time like the present to check out the poke bowl and see what all the buzz is about! There are two ways to do poke bowls at Abunai Poke: customize your own from the bowl up, or dig into a pre-designed signature bowl. If you opt for build your own bowl, begin by selecting your base, spring mix with or without rice added. Then, pick your protein from a list that includes the classic Ahi, salmon, shrimp, and tofu. Next come mix-ins, such as white onion, roasted sesame seeds, and cucumbers, followed by sauces that range from miso dressing to wasabi aioli. For the final flourish, add some avocado, masago, or edamame. If you don't want to go to the trouble of constructing your own bowl, simply order a signature entree like the shrimp poke, garlic ahi, or spicy salmon bowls.